From time to time there is interbreeding between wild Felis silvestris and domestic F. catus cats, and known records indicate that this is usually wild tom to domestic female. In Scotland the interbreeding was though to be occurring so frequently as to threaten the wild species, Felis silvestris grampia. 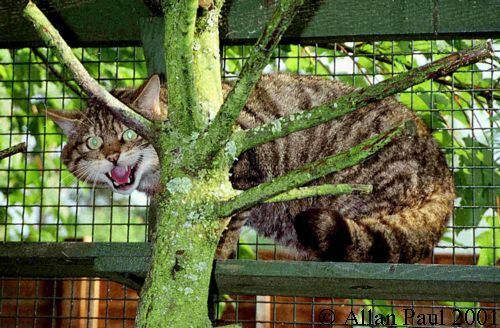 The British Nature Conservancy Council carried out a study into this interbreeding and in its 1987-1988 Annual Report for it states that, as a result of less intense persecution, wild cats are increasing in Scotland, where they had been all but exterminated by 1900. As long as wildcats were confined to remote areas their genetic integrity was probably secure, as the wildcats were unlikely to come into contact with domestic cats. But there is now evidence that, as the wildcat recolonised parts of northern Scotland, the two have interbred and hybridisation is now a threat to the wild species.